If you are building a house without a basement, your foundation will either be a concrete slab or a crawlspace. which serves as a base for the concrete. The slab foundation has advantages, the primary one being cost. 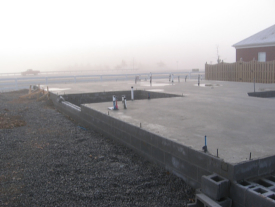 A slab foundation is significantly cheaper than a crawlspace. In my own experience, I have found slab foundations to be between five to ten thousand dollars cheaper than a crawlspace on a three-thousand sq. ft. house. 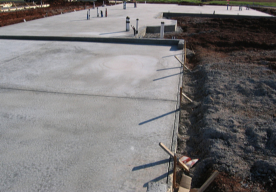 Slab foundation houses are quite common in warmer climates. There is no need for floor insulation. The floor never squeaks or sags. A good slab foundation makes a very solid house. Slabs may be formed with concrete block or wood framing. I’ve found block framing to cost 10-15% more than wood framing.